We hope this e-blast finds you healthy, happy and well settling into 2017! We are very excited to announce… tooth-e is back!!! 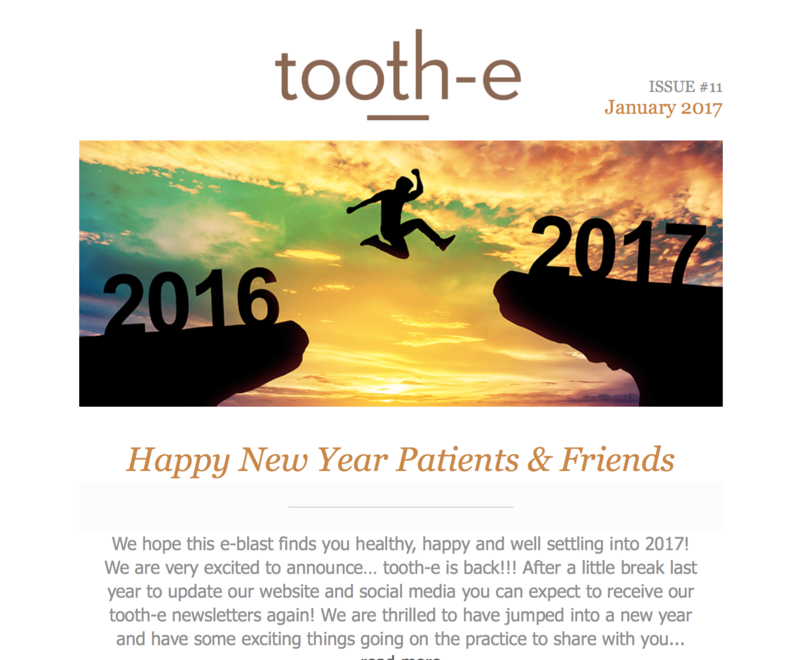 After a little break last year to update our website and social media you can expect to receive our tooth-e newsletters again! We are thrilled to have jumped into a new year and have some exciting things going on the practice to share with you. This past year we upgraded not only our website but the dental equipment in our primary treatment rooms. For our patients, this means improved comfort, procedures, efficiency and overall experience. So far our patients LOVE the changes and so do we! Last year we also attended a two-day retreat & seminar at Spear Education in Arizona for some exciting team development. It was an incredible learning experience! The team grew professionally as well as personally and each of us left with renewed spirit, value, improved wisdom and new tools to support patient care. Next, as many of you already know, our team has grown. This past year we welcomed Kristi Boschetti (Crumpacker) back to our hygiene team. It has been a delight to have her back; she is currently seeing patients two days a week. On a similar note, we are thrilled to announce we are adding another dentist this coming April! Dr. Melissa Spaulding graduated from Loma Linda University Dental School in 2008 and will be joining our practice permanently this spring after some maternity time to deliver her first baby. We are excited to have her join the team and are anticipating Dr Spaulding will offer more flexibility for our patients and schedule. With all the excitement, we look forward to seeing you and sharing more with you in person! Water pH - Does it Matter?